Lauloa Complex a Home To Many A Happy Returning Guest! 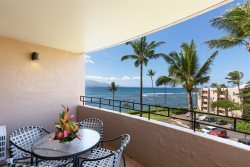 Feel at home in this lovely condo retreat DIRECT OCEANFRONT A glorious view of the breathtaking Maalaea Bay, the grand volcano Haleakala and the sparkling Kihei lights at night. Relax and enjoy the very best we have to offer... Soothing sights & sounds of the ocean from your living room and master bedroom lanais, spacious master bath with walk-in shower (grab bar) master king size bed, guest room king size bed (upon request can be made into twins), guest tv/cable, spacious guest bath with walk-in shower central air-conditioning, free secured wifi, internet, cable, well stocked & updated kitchen, washer & dryer, convenient elevator to the 2nd floor, pool, bbq, pool side lounges, beach chairs, beach umbrella, beach towels, binoculars for whale watching, cooler for your excursions, free on site parking, comfy island decor and more! Overall we thought the condo was lovely. Very clean and well stocked. The location - perfectly centralized. The view wonderful. Saw turtles, surfers, fisherman, and paddle boarders daily from our lanai while enjoying our morning coffee. We really enjoyed the laidback peaceful quiet setting. Very low key location to return to after a long day of site seeing, or activities. We couldnt believe how clean and well stocked the condo was, and we are extremely picky. Your cleaning service is the best we have seen anywhere. We are entertaining the idea of a return trip to Maui, but booking would depend on the availability of #204. We are spoiled now and dont want to stay anyplace else. Good working air conditioning was a must for us, and you really delivered. Thanks for the memories. A perfect getaway! This was our first VRBO experience and it did not disappoint! Right from the start we were happy with our choice. We are a family of four with two teens. This condo offers plenty of space for our family. It was spotless, the views are breathtaking, (we LOVED watching the sea turtles and surfers off the lanai), everything was in working order, and the beach supplies were such a nice bonus! Having a full kitchen (and fully stocked with all pots, pans, utensils, Tupperware etc etc), washer and dryer and all the small appliances we could want was wonderful! The A/C was also KEY for use when we were choosing our condo. The location was perfect for us. It is located between Kanaapali and Wailea, two towns we frequented. A car will be needed as it is not a resort town, and does not have beach front but for us that was totally fine. We truly had an amazing two weeks and we thank the owners and managers for keeping it so beautiful. We will miss going to sleep to the sound of the surf crashing on the shore. Location, location, location! My fifth trip to Maui from Florida, and it was the best! Two weeks in this amazing condo made it possible to really experience Maui. Every day, we sat on our balcony to enjoy our front row seats, amazing sunsets, turtles and surfers. We walked to the aquarium, the shops, and great restaurants. Two bedrooms made it possible to split the cost with my sister and her husband. Well furnished, with everything needed for a great vacation. Maui Paradise! Condo is as pictured and is very well furnished. The views are amazing and the sea turtles hang out right out your back door. Would recommend to anyone who is looking for a peaceful Maui get away. Convenient to the entire island. Mahalo! Ahhh... Paradise What a great location, an amazing view, and oh so convenient. Loved staying in this condo. It's well stocked (from the full function kitchen to beach chairs) to make our stay comfortable and fun. We were able to easily get to Lahaina (for the best shaved ice), down to Wailea ( high-end shopping and Tommy Bahama's for great food) and across to Kahalui for the weekend swap meet. From the condo, we could see a dozen sea turtles swimming in currents just next to the shore. At night, we could hear the waves lapping on the shore. We couldn't have asked for more to make our vacation a truly memorable experience for our family. We'll come again. Great location. Great service from Andreas. We totally enjoyed our stay at this condo. As previous Maui visitors, we were not familiar with the Maalaea Harbor location and were a bit hesitant as we could see that the properties were older. The age of the overall property was totally not a problem. We really aren't the big fancy resort type people so we really enjoyed our close parking, quiet, fewer people, and quick access to the pool and waterfront. Our adult son and daughter in law (30's yo) joined us and they were also impressed. The location of the bedrooms allowed for privacy. They were able to use our rental car and due to the convenience of the location, we could also walk as needed for our outings. If you want the sandy beach, it is a very pleasant maybe 1/2 mile walk. We enjoyed the aquarium and booked our Molikini Crater snorkeling adventure at Maalaea harbor and walked from our condo. Of course, the condo as depicted is waterfront and we enjoyed sunrise, sunset, moon glow on the water, watching boats in and out of the harbor, and, of course, the turtles. We also watched others fishing from the shore or spear fishermen. We enjoyed the great location. Very close to get to either side of the island and our visit was only 5 days so this was important. Also close to some great restaurants Lahaina or Kihei. The condo is fully equipped and a lot of special thoughtful inclusions such as the Road 2 Hana CD, binoculars, ice chest, Maui guides, all the kitchen and laundry basics including some spices, oils, etc. We left a few too (cupcake liners plus some others). There is also a floor fan (there is central AC and ceiling fans that are more than adequate and the floor fan wasn't really needed but was nice to add). The kitchen is equipped for all cooking and the utensils are nicer than I have at home. Andreas called us the day before and we had his number for any issues that might arise. The ice maker did go out and he came and promptly checked it out and left us 2 bags of ice and replaced those 2 days later. The repairman was prompt too but a part had to be ordered. The washer dryer even though stacked are both full capacity. An improvement I would suggest is additional bed pillows (firm and soft) and perhaps an update of the bed coverings. The patio door curtain panels were a bit twisted but that was minor. Also the panel separating the master bedroom from the den while functional does have a separation that doesn't feel completely private but was a real problem. WOULD RENT AGAIN! Andrea called before we arrived to make sure we had the code and to answer any questions and offer his services while we stayed at Laura. How thoughtful. We loved our condo. But my sister was concerned about the safety of leaving the patio doors open when our unit was on the second floor above the pool area. We left them open while we were there but not at night. We'd be interested in a unit on a higher floor and possibly away from the pool area. We try to come to Maui every three years (it takes a while to save up!) but we were very happy with this location so we just might be back.